Yet another virtual store has been announced, this time for the HTC Vive, and it’s called Viveport. The new app store will be a central hub for all apps, games, and content that the Vive virtual reality solution supports, but the Valve Steam platform will still be used for most game titles. 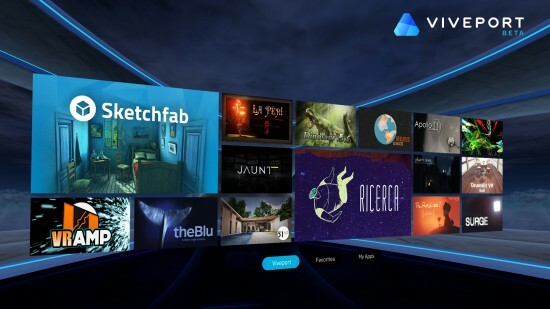 According to HTC (via Windows Central), Viveport will be accessible via the HTC Vive’s Home, and will serve a customizable experience for educational and entertainment content. Today at VRLA, we are announcing Viveport as a place where people can discover the latest and greatest in VR content and experiences. Viveport will feature content across exciting, new categories for VR–like information, edutainment, social media, 360˚ video, news, sports, health, travel and shopping. The upcoming release will also introduce an update to Vive Home, which is our personal and customizable virtual space with interactive widgets and more. A developer beta will be available in a few weeks, and consumers in 30 countries will be able to browse crazy-cool, immersive experiences in the store later this fall. We will be inviting both the creator community and Vive users to Viveport as the destination to discover, create, connect, watch and shop for the things they love and need in life. Viveport has been announced just a few hours ago, and will roll out to HTC Vive owners later this year. No exact release date available. Do you see yourself using the Viveport?